If you’ve recently found yourself on Dawson Street, you’ll have noticed the mound of rubble where a large office block once stood. You might even have thought that, were the concrete removed, the area would look much more open without further construction. 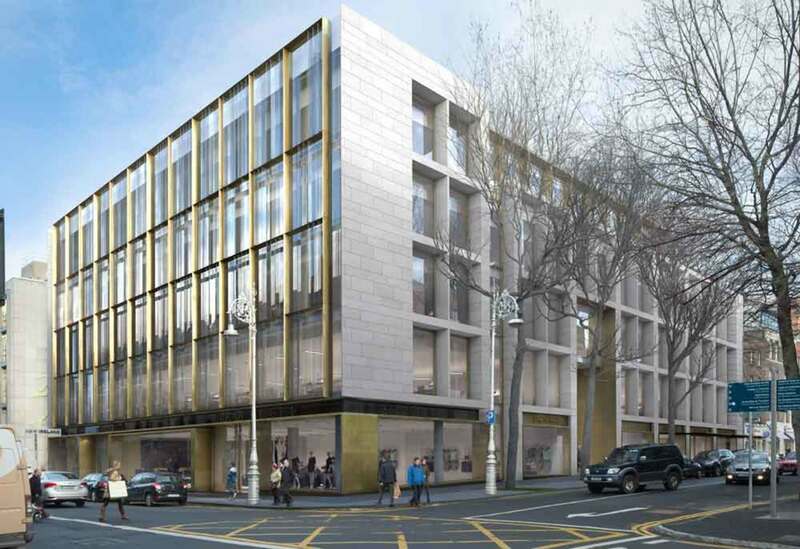 Having demolished the 1970s Royal and Sun Alliance headquarters, property investment group Green Reit propose to more than double the space of the previous building at 13-17 Dawson Street. They can’t very well expand onto Dawson and Molesworth streets, so they’re building up – and down. Their new retail/commercial space is due to be completed in 2017. The previous space occupied a gross floor area of 5,101 square metres over five storeys. The new development will expand this to 12,756 square metres over six storeys, including lower ground and basement floor levels. According to the proposed plan, the new construction will include a retail unit over lower and ground floor levels, a café/restaurant at ground floor level, twenty-seven parking spaces, a hundred bicycles spaces and four motorcycle spaces. There will also be ESB substations, a Luas stop cubicle, and a plant area at roof level. On 6 March last year, the company put forward their application, and by 28 September final approval had been granted. Despite several appeals and complaints lodged by An Taisce, Dublin City Council gave the go-ahead. 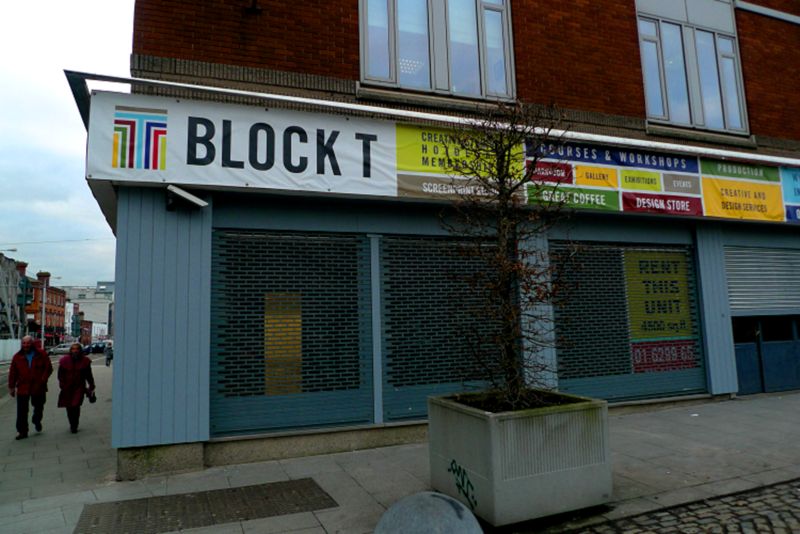 An Taisce objected on the basis that the “demolition of a re-usable building and replacement with an oversized ‘statement’ building is inconsistent with the requirement for sustainable development”. This is based on the Dublin City Development Plan 2011-2017. 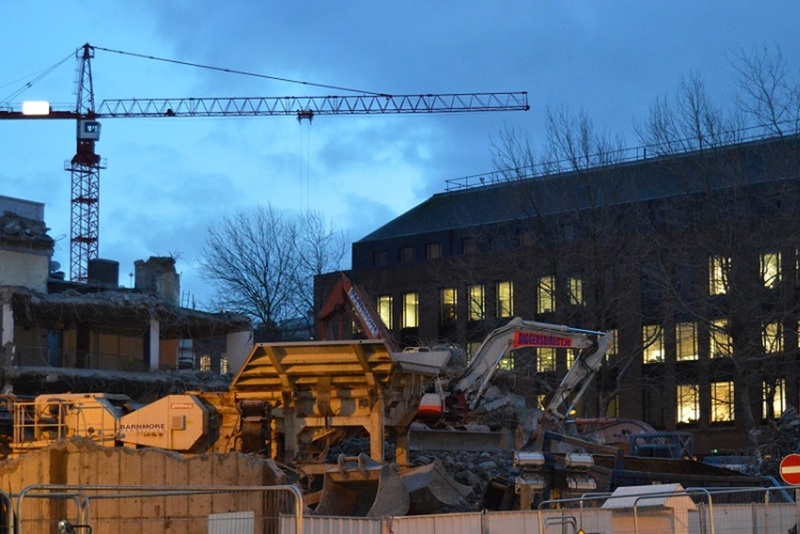 According to An Bord Pleanála, the rationale behind the demolition was “based on floor to ceiling heights, costs of replacement of outdated mechanical and electrical services, significantly more energy consumption, efficient and sustainable surface water drainage arrangements, outdated and inefficient internal layout and circulation, design and visual amenity”. With no objection from the environmental-health officer, the drainage division or the city archaeologist, the demolition was allowed. 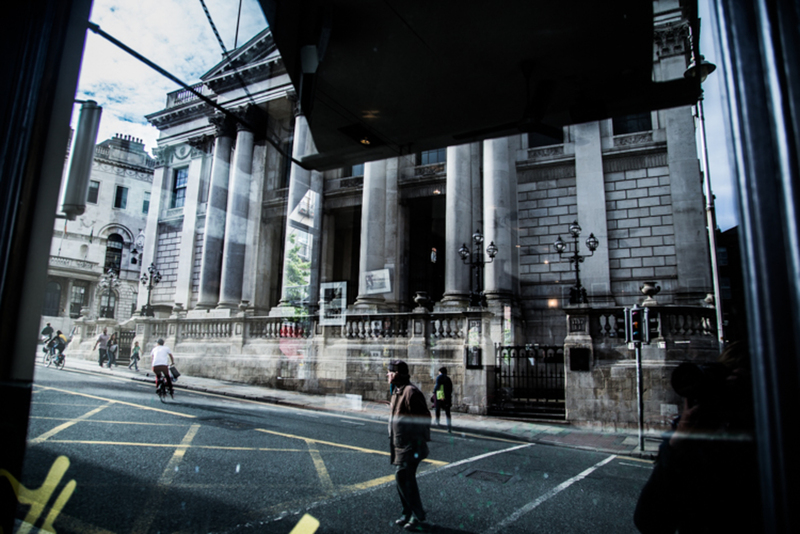 According to the Dublin City Development Plan 2011-2017, the primary purpose – planning-wise – for this part of the city “is to sustain life within the city centre through intensive mixed use development”. In this case, it comes down to how you interpret the language. Essentially, the businesses forced to close when the building was locked before demolition were necessary sacrifices. In order “to facilitate the development of the central area, and to identify, reinforce, strengthen and protect its civic design character and dignity”, these had to close. In the eyes of the council, the new development will create jobs and further stimulate the retail sector. In other words, wheat from the chaff. Marketing for the new structure is due to commence during the summer, but it’s unclear yet who the occupants will be. The proposed floor space gives an idea. About one-sixth of the total floor area is to be occupied by a retail unit measuring 2,147 square metres, fronting on to Dawson Street. This is flagship territory here. Hodges Figgis bookstore, across the street, occupies 2,588 square metres, whilst Tower Records further down takes up 1,739 square metres. Both are amongst the largest stand-alone stores in the city. Fixx coffee, seemingly the only previous tenant invited back, will presumably occupy the 218 square metres designated as the café/restaurant space. A spokesperson confirmed this, as does their website. The remainder will be sub-divided into a combination of modern office space and parking space. The fourth and fifth floors will have terraces overlooking the surrounding areas. According to an architectural design report, the new building will incorporate a “bronze ‘brise soleil’ frame” with cladding, natural light, coloured limestone, glass fins and stone reveals. Spokespeople for Green Reit and Henry J. Lyons architects could not be reached to confirm these details at the time of publication. With construction due to begin, amid the clamour of the ongoing Luas Cross City works, it seems Dawson Street and environs won’t get a moment’s peace. When they do, will it be a booming retail hub with well-oiled transport amenities? Or a confusing series of thoroughfares overlooked by an overly stylised construct? “You might even have thought that, were the concrete removed, the area would look much more open without further construction. Why should it be more open. Cities are all about dense neighbourhoods and commercial centres with lots of activity. Bring on the new building I say. 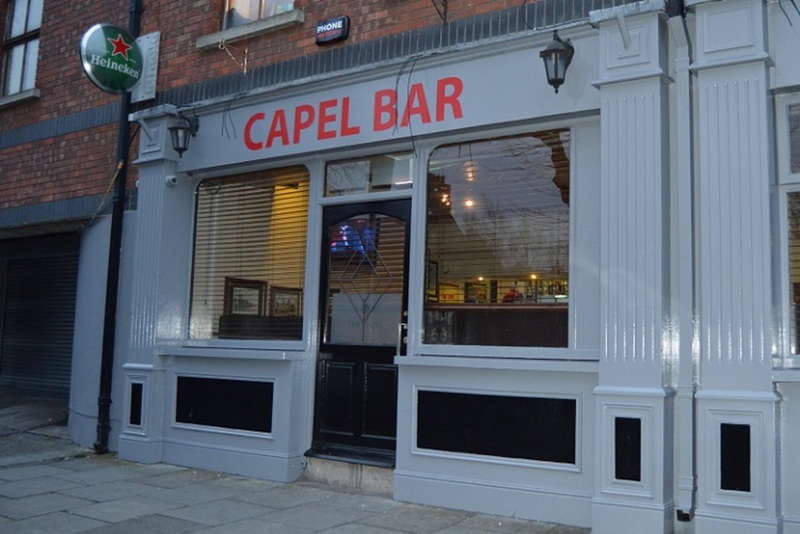 Coffee shop, Spar, coffee shop, Spar, coffee shop, Spar… Dublin just gets blander and blander.